In late 2013 Xavier Quijas Yxayotl—Huichol composer, musician and artist—shared his life story with me. It was a real privilege to hear of his origins, struggles and inspirations. The thing about Xavier is that you’d normally never know the details of his backstory. But maybe you would pick up there’s something deeper. He carries a sense of humility that typically only comes by having gone through hard times…survived…and having instilled great meaning in his life, touching others through his craft and presence. Portrait of Xavier Quijas Yxayotl with one of his handmade ancestral flutes. ©2015 Barry Wolf. All rights reserved. Used with permission. With permission I turned his disclosures into a narrative that was picked up in 2014 by Still Point Arts Quarterly for their Fall 2015 issue. I thank editor Christine Cote for giving this important story space. I can now share the story in its entirety here as Xavier told it to me. I hope you are as inspired as I was. The boy fidgeted. He was in foreign territory, held prisoner by his mother’s hand on his arm. They sat side-by-side in matching chairs before the great divide of a massive desk. His mother’s voice rose and fell. Words tumbled over each other as though, if she didn’t get them out fast enough, the man considering them would summarily swat them out the door, no different than pesky insects. An hour before, his mother pulled him along inner city streets into a massive building. They finally stopped in front of one door among several down the long hall. She smoothed her skirt and combed fingers through his black hair. With a deep breath, she opened the door. The secretary looked up. “Please, I would like to see the director,” his mother said. “Do you have an appointment?” The secretary appraised them, noting their dusky skin and worn clothing. When she shook her head, the secretary motioned them to a row of chairs against the wall and picked up the phone. They waited. The man behind the desk was impeccably dressed in a gray suit matching the color shot through his dark hair and mustache. The lines in his face softened as he listened, shifting attention from the Indian woman before him to the boy, eyes downcast, clutching a notebook in his lap. The woman continued at length relating how, in the last two years, her son kept running away to live on the streets. Xavier slept in parks, skipped school, survived by selling newspapers and shoe shines. Terrified, she would search and drag him home, if she was fortunate to find him. But the next day he’d be gone again. He wouldn’t do what his father wanted: to set aside these silly pastimes, to work making shoes to help support the family. “We have seven children. Xavier is the youngest boy. We are very poor. But he is so different and I’m afraid what might happen to him. Is there something you can do?” She finished softly. Maestro Caracalla told her to bring the boy back the following Monday, handing over a long list of art materials to buy. There’s not enough to eat! How can we buy art supplies? Guilt flooded Xavier’s mind. He was certain of a dead end. But at the appointed time his mother delivered him to the Maestro. She could only muster a clean new drawing tablet and 6B pencil, keeping even that small expenditure hidden from her husband. The secretary ordered a sandwich for Xavier, although he said he didn’t need anything. Painting by Xavier at the age of 18. Photo courtesy of Xavier Quijas Yxayotl. All rights reserved. Xavier with one of his painted pow wow drums. Photo courtesy of Xavier Quijas Yxayotl. All rights reserved. Continue reading Xavier’s story here and find out how he returned to the Huichol roots denied him as a child, and went on to resurrect ancient instruments lost to time through visitations from his ancestors. Back in April before I left to walk the Camino de Santiago, Jacques Laliberté made the trek out to my place to interview me for 5enses Magazine, a local publication featuring the arts and science in the Greater Prescott, Arizona area. Jacques is a fellow artist, and over the 20+ years he’s lived in this area has had regular columns on art and related subjects. Even so, we were barely acquaintances; our paths had crossed just a couple of times. I’ve been interviewed several times. But not like this. Before I knew it nearly three hours had passed. And I’d spoken of things I normally keep to myself on the deeper elements of my life and work, not usually the stuff for mainstream consumption. This was more like a chat between friends sharing life experiences and some of those things that are unexplainable in the spiritual realm. The interview has just been published in print and online. Somehow he was able to condense all the ground we’d covered into a quite readable story…and kept some of the most personal things I’d disclosed to himself. Thank you very much. It’s an apparent talent. Thus — in her ‘The Lifepath Dialogues’ blog — Prescott artist Carla Woody imparts the first of many lessons in a way of living. Artwork and writing are two of the primary ways she’s integrated her far-flung experiences circumscribing a circuitous path around the globe. If you’d like to read the entire article, please go to 5enses. After many years in Prescott, Jacques moved down the road a bit. He now considers himself a Paulden artist, writer and graphic designer creating book covers for those who self-publish. His first novel The Fictional Autobiography of the 21st Century’s Greatest Artist Andienne Brünsilder was published in February. It’s available locally at the Peregrine Book Company. I haven’t read it yet. But if he writes fiction the way he puts an interview together…it’s got to be good. I noticed the foreword was written by Mick Jagger, which has got my curiosity up. For more information on the mission of Kenosis Spirit Keepers, events and what we support, go here. For more on Kenosis spiritual travel and other programs, go here. When I’m especially taken with a book, I greatly anticipate the author’s next one. This was the case with one of my favorite novelists, Jim Fergus. Visits to his website had promised one for several years, even with a specific title and subject matter that is of interest to me. But each time I checked … nothing … and I’d log off disappointed. A few weeks ago I checked, this time discovering he had a new one out. I promptly ordered it. Yet again he’d produced a story that touched me in tender places, as much as it informed. I did something I don’t normally do: I emailed him to express my gratitude that he’s writing again. He responded. It started a conversation. Jim told me the book had been published in France and done quite well. But when he went searching for a US publisher, no one was interested. Unbelievable, I thought. This is a writer whose two previous books—One Thousand White Women and The Wild Girl—were bestsellers! But with this new one? He’d stepped out of his genre of The West and Native Americans. He was no longer in the neat slot US publishers had placed him—therefore, a risk. This goes to show that even widely celebrated writers—and any such artists really—don’t necessarily have it made, as our fantasies tell us. They’re subject to the same tight restrictions and imperious whims if they depend upon the old-school bureaucracies and structures. Now he’s writing a sequel to One Thousand White Women, the genre he’s known for, accepted by US publishers. There’s no doubt I’m wildly anticipating its publication. And I’m quite sure it will be a commercial success. I also mentioned that it’s the same with most art galleries. To accept an artist’s work, they want to make sure you’re consistent, no matter your talent level. Consistent in this definition means same general subject matter and media, same slotting as above. I’m fortunate to have found two galleries who are happy to show my work, no matter how much I experiment. And I do. I’m not a production line. All aspects of my work—mentoring, spiritual travel programs, writing or art—appeal to a particular small niche, not the mainstream. And I’ve got much gratitude to those who engage with any of it. It means we’re part of the same tribe. The assembly line is going away. The things that used to make you feel safe are now risky. Putting something new into the world? The industrial order doesn’t want us to do that. Change comes from the margins. When you do something out of the box, you’re not going to be picked by the old regime. Bottom-up change is the future, not top down. One person can make a difference. You matter. Find people who agree with you and lead them to greater depth. You’re an echo of your art if you’re not making new art. Do it as the gods would do it: with intent, no holding back. 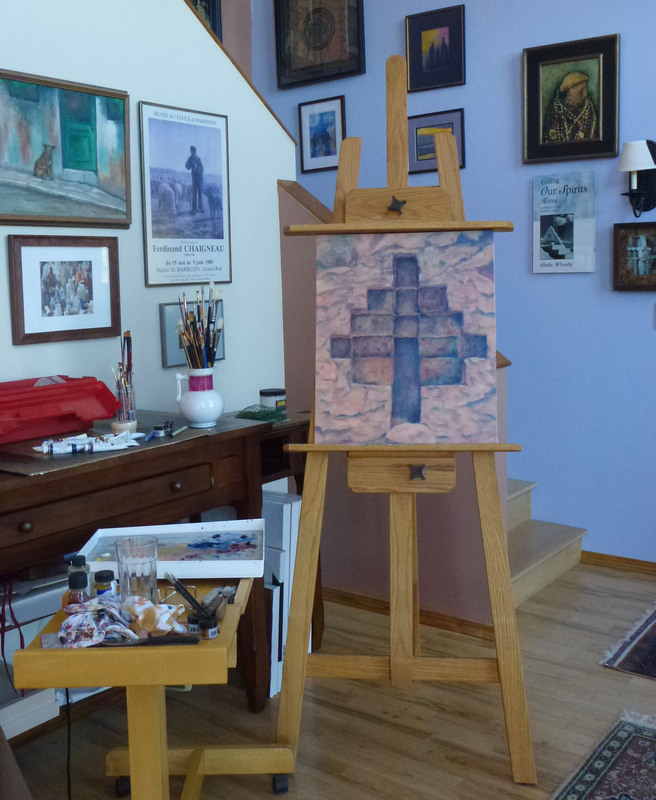 Mystery School currently in process on the easel. This is the time of year—as we’re on the threshold of the next one—when I remind myself of these truths by viewing Sean Connery’s rendition of Ithaca by C.P. Cavafy, featured in this blog before. Engage your passion. Fine tune. Put it out there. Truly, Jim Fergus is one of my favorite novelists having also read ONE THOUSAND WHITE WOMEN and THE WILD GIRL. This book is indeed a departure but at least equal to the others. I was personally touched by Chrysis’ striving against convention and evolution as an artist, and Bogey was portrayed as though the writer had lived inside those very emotions. The foreword shared why a man could write this way about love, and only at the end did I realize the characters had actually lived. I’d been waiting a long time since THE WILD GIRL for Jim Fergus’ next novel. I’m very glad he’s writing again. Now I’m looking forward to MARIE-BLANCHE. **To view my books and readers’ reviews on Amazon, go here. To view artwork online, go here. ***I recommend listening to the unedited versions of On Being interviews with Krista Tippett. They’re much longer but without the fine polish that editing brings. They’re real. Apab’yan Tew is an Ajq’ij, a Day Keeper, spiritual guide, dancer and musician, of the K’iche’ Maya tradition from the village of Nawalja’ in Sololá of the Guatemalan highlands. He approaches his sacred calling with humility and passion. I am honored that he’s part of my spiritual travel program in Mayalands during which he shares openly and holds a fire ceremony to send prayers and call upon the ancestors. In November 2012 I interviewed Tat Apab’yan on the subject of Maya worldview, farming practices and the GMO issue. I included many of his words in Seed Intelligence: Indigenous Perspectives and Our Collective Birthright published in the Anishinaabe (Ojibwe) Farming Curriculum developed by Honor the Earth Foundation for Tribal Community Colleges. His words are so important for our understanding of the integrative way traditional Maya people live, as well as other Indigenous peoples. I’m sharing an excerpt of our two-hour conversation with you here with his complete permission. I hope you enjoy the excerpt and take his words to heart as I did. To learn more about Spiritual Travel to Chiapas, Mexico: Entering the Maya Mysteries in February 2016, go here. Join us and experience Tat Apab’yan’s teachings in person, along with those of other Maya spiritual leaders and healers who serve their communities. A warning though: It’s life-changing. Tuitions support the continuation of Indigenous traditions and help the spiritual leaders, their families and communities. A portion is tax-deductible through Kenosis Spirit Keepers, the nonprofit extension of Kenosis. Grandmother Flordemayo had twice mentioned Dianna “Snow Eagle” Henry to me during my visits to the Seed Temple in Estancia, New Mexico. Each time she lamented, “You just missed her! She was here helping but went back home.” Home turned out to be Arkansas. When Flordemayo began to establish the Seed Temple, which Kenosis Spirit Keepers helps support, she called Dianna to consult her expertise regarding seed preservation. Dianna has gone back and forth providing service ever since. The last time I was there, Flordemayo put a book in my hands. Dianna’s coffee table book Whispering Ancestors: The Wisdom of Corn is an illustrated treasure trove of information on Native varieties, some lost to time and then resurrected. In certain ways it takes you back in time by identifying which Native Tribes carried different strains, planting instructions—and hints at the esoteric, ancestral knowledge in the Seed Collective. I was intrigued. Photo Credit: Wisdom of Corn. Dianna consented to an interview for The Lifepath Dialogues. Below you’ll find the audio recording uploaded to You Tube. She graciously shares how the seed-saving path opened to her, rather unexpectedly as passions sometimes do, and the ways that spiritual knowledge from seeds began to come. One of the many things I appreciate about Dianna is her willingness to follow a path that’s unknown but fueled by intent. She shares it all. Kenosis Spirit Keepers is pleased to sponsor Grandmother Flordemayo, Dianna Henry and Greg Schoen for events in Phoenix on January 31-February 1, 2014. Greg is also a respected seed saver with many years’ experience and will take us “down the rabbit hole” into the mysticism of seeds. 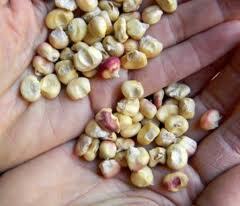 You can read his article about Rainbow Corn in Mother Earth News here. This Friday night talk and Saturday experiential workshop will directly benefit the Seed Temple’s preservation work. You’re invited to join us and know that—as you are receiving the teachings—you’re also benefiting the wider work of global consciousness. In October 2012, I was visiting friends in Lafayette, Louisiana—Cajun Country—and fell in love with the area. My time there was made that much more interesting by meeting Becca Begnaud who is a traiteur, a Cajun prayer healer. I was invited to interview her for The Lifepath Dialogues during a program of hers. To me, the outcome was fascinating. We cover a lot of ground. Listen to Becca as she talks about what it means to be a traiteur, Cajun culture and challenges on the path as a healer. It’s worth 38 minutes of your time. I will be returning to Lafayette shortly. Becca will be sponsoring my work for her Healing Arts Collective. You can find the details of the November 15 talk Timeless Pathways for Today’s Spirit Keepers and November 16 workshop Asking the Answer in this downloadable flyer. I’ll also be giving a talk in Baton Rouge on November 14 at The Red Shoes, a center for personal and spiritual growth. I’m very much looking forward to returning to this area, rich in so many ways.